An uneven, un-blended cakey base is a thing make-up nightmares are made of! We get it, we have all been there. While some of us are pretty old school when it comes to make-up application, especially the base, some trust the tools. There is definitely a science backing up the fact that applying make-up with your hands does help it distribute evenly because of the heat, but there is a copious amount of product wastage sometimes. If you want your base to look like second skin, these babies need to be a part of your make-up kit. Check out these game-changing beauty tools that will help you fake flawless skin! Even make-up application needs a clear and even base. So here are a few steps to ensure you are prepped and primed. Start with a clean canvas, cleanse well. Never skip moisturiser! Start with moisturised skin. Give your skincare at least 15 minutes to sink in. Prep-time is the best-kept secret of most make-up artists! Here are some seriously amazing overnight moisturisers to wake up to gorgeous skin! Now that you’re a pro at prepping and priming, let’s jump get to know the magnificent tools! This egg-shaped beauty sponge is a complete game changer! Just run this under some water and wring it out. Blend in your foundation, and concealer and even dab on blush with this versatile tool, and you will be left with a very dewy skin finish. Do note, when you are using the beauty blender, use a dabbing and patting motion, do not drag this across your skin. This fluffy powder brush from RT is great to set your face with some loose powder or even to apply a powder foundation. The domed shape diffuses the product well giving you an airbrushed look. An easy, 2-minute foundation application is a reality with this brush. This is your best bet to get the fullest coverage out of any foundation. The bristles are super soft and glide the product across every contour of your face. This is ideal for beginners. Blend your concealer with this fluffy concealer brush, it will diffuse any fine lines and ensure you have a creaseless application. Get your highlight on point with this fan brush. It applies just the right amount of highlighter on your high points and distributes the product evenly. For an all-in-one kinda gal, this is the perfect make-up brush set. 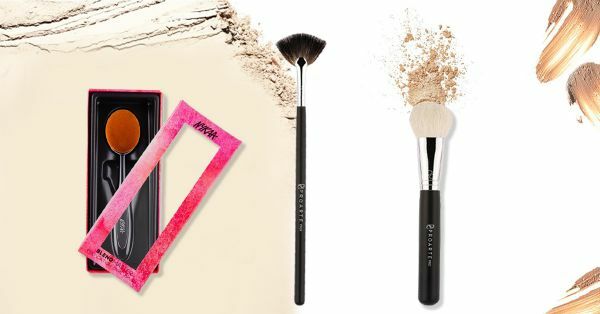 It’s got everything you need to perfect your base make-up! The best part about RT make-up brushes is that they’ll last you for years! This lightweight mist is packed with vitamins and minerals to hydrate your skin and set your make-up all in one go! Use it before or after applying your make-up, you can even use it during the day for an instant pick-me-up. A setting spray is a MUST if you’ve used a lot of powder make-up. Mostly used as a primer, it helps minimise the appearance of pores. Benefit’s signature product also keeps your foundation looking smooth and creaseless all day and increases the longevity of your make-up. It comes in a universally flattering colour too. Now that you’ve perfected your base, we’re sure you are looking for some amazing make-up products worth the splurge! Check out these best-selling products!